User choice is a core principle with which we design our products. In particular, we’ve found that the best way to design products is to craft experiences where our users understand the choices they are making and ensuring those choices are respected. A recent example is how we evolved our strategy around search in favor of a more geographically targeted approach to search. First, when we changed the default search provider shipping with Firefox in a relevant geography, if a user had chosen a specific search provider as default before the switch, we respected that choice and made no change to that user’s default. Second, we redesigned the user interface to make it easier to both change the default search engine as well as choose different search engines on a per-search basis with a single click. Our user research shows that this new interface works – users can and do quickly and easily make changes to their search preferences. During the upgrade process from a previous version of Windows, if you have set your default browser to Firefox, Windows 10 overrides your default browser to Microsoft Edge in a way that’s hard for users to detect or fix. After you’ve installed Windows 10 and either noticed your default apps had been replaced or want to change your defaults, Windows 10 makes it very hard to reverse those changes. Not only are user’s previous choices overridden during the upgrade process, when combined with the new difficulties in setting default apps, non-technical users will have a very hard time setting their choices with any third-party browser on Windows 10. We’ve also noticed that the lack of choice isn’t limited to the applications. 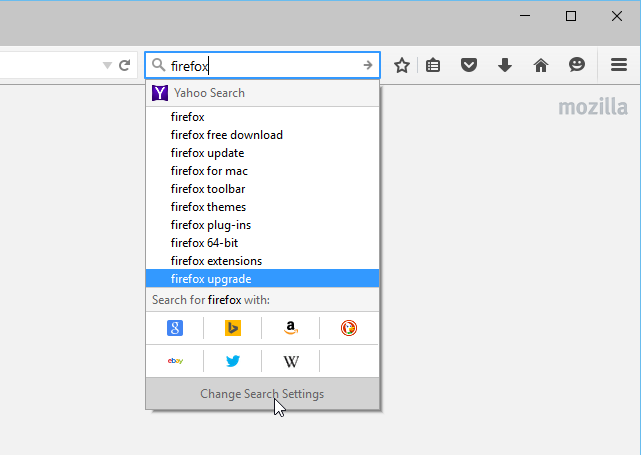 Once you’ve chosen Firefox (or another browser) as your default, if you execute a Web search through the Windows 10 Cortana feature, regardless of your default search provider, the query is automatically sent to the browser as a Bing query. Not only is choice ignored, there does not seem to be any way to opt out of this. You might notice that we’ve been able to mitigate some of these effects through workarounds, but the workarounds don’t work for all versions of Windows and can be easily defeated if Microsoft decides to change Windows. Importantly: we shouldn’t have to create workarounds to preserve user choice – it should be designed into Windows 10. We are always happy to see innovation in browsers and Microsoft believes it has done something truly innovative with Edge. However, it is unfortunate to see Microsoft not allow other applications to compete with Edge on a level playing field within Windows 10. Because users are best served when they choose products based on their merits and not on skewed criteria or without their knowledge, we feel that Microsoft isn’t putting their best foot forward with regards to the principle of choice. We know that if Microsoft were to re-embrace the principle of user choice, it would make the right decisions, respecting users and creating an environment in Windows 10 that treated all applications, Microsoft and non-Microsoft alike, fairly and equitably. Ultimately, expressing this kind of respect for users in their products will reflect well on Microsoft.